Dr. Jean Montrose had no doubt that the intense abdominal pain of Robertson Kelso, wife beater, child abuser, corrupt businessman, and Perth's most hated man, was appendicitis. She was also sure it wasn't fatal. But after his admittance to the hospital and an emergency operation, Robertson Kelso died. The, question is what - or who - ­killed him. 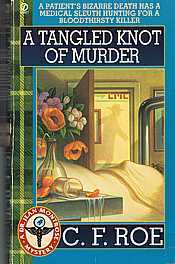 Police inspector Douglas Niven has a host of suspects who are glad Kelso is dead. On the top of his list is Dr. Hugh Kirkwell, the doctor who performed the operation. Now Dr. Kirkwell is in danger of losing his license and his freedom... unless Dr. Jean Montrose can diagnose the means, motives, and opportunities for homicide. But when Dr. Montrose gets the puzzling results of Kelso's autopsy, she needs to do some cutting of her own...to the bare bones of someone driven to madness and murder..